I knew this would happen when spring came. After three months of conscientious blogging twice a week, the sun came out. The plants started pleading, “Come! 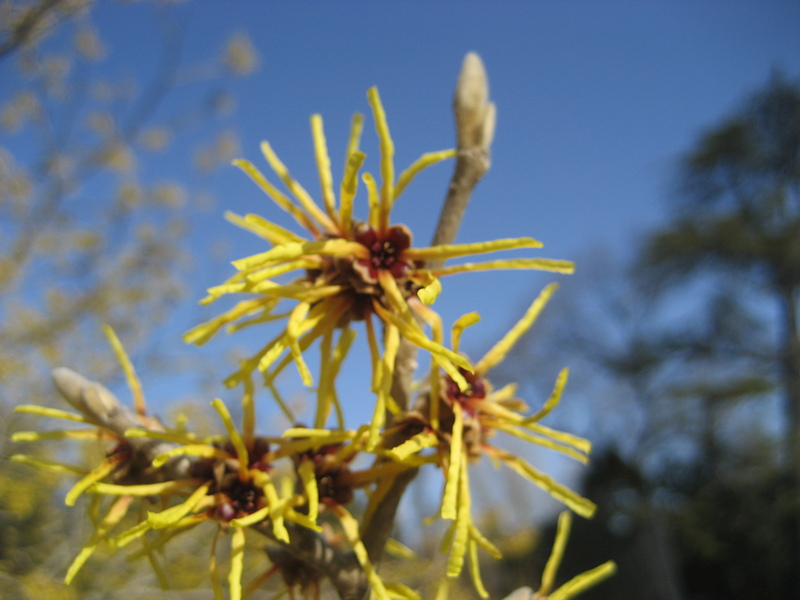 Come trim back our winter coats so our new shoots and buds can breathe!” The compost bins buzzed with the sound of 2 wheelbarrows full of the finished stuff (my best winter yet – I’m so pleased). And, the long awaited fence and arbor arrived in multiple pieces. I had work to do. Outside. How could I possibly find the time to blog? Thanks to a few of you who commented on last week’s post with phrases like, “great start, but where’s the finished product?” I’ve been shamed into sitting inside at my computer to share the fruits of last week’s labor. The 9 post holes were a pain because whoever built my stone house tossed all the leftover pieces of rock into my back yard. (See last week’s post for my ingenious plan on recruiting workers. Sylvana commented that I was a regular Tom Sawyer. Highest praise, to be sure). Then came the leveling. Wow. Who knew that a grade of 4 inches over 10 feet would wreak such havoc on the amateur fence installer? It took longer than it should have, but by Saturday afternoon, we had all the big pieces in. It was all but finished. 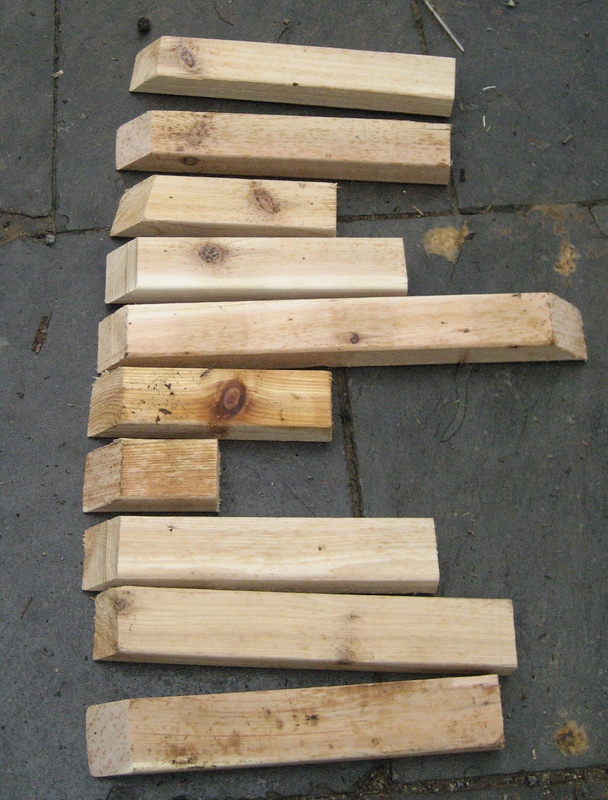 Then came the two 15 inch sections that needed mitering on one side. 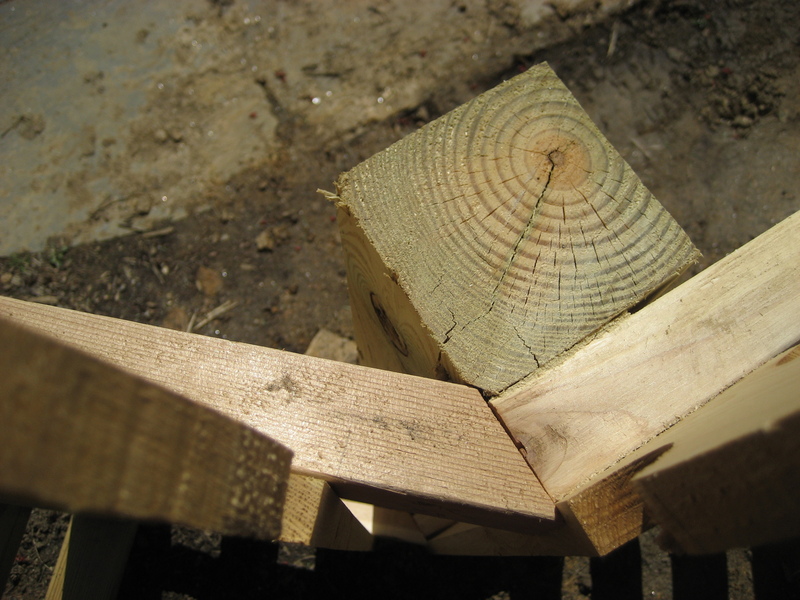 While I impressed the fence supplier with my knowledge of mitering (meaning, I knew the definition of mitering), I must admit that I fell short on the execution. If I had just been willing to buy a power miter saw, I would have saved myself much agony and many many hours. But – I would have used up the $95 (and more) that I saved by hauling the supplies myself. That money is for roses, darn it, not power tools. So I made do with the old miter box and hand saw. It was not pretty. You can see how many tries it took me to get it right. I am showing you the following picture only because I’m having a rare moment of openness and vulnerability. My mantra while attempting this advanced (?) carpentry technique was this: “No one will ever look closely. No one will ever look closely.” And now, here I am, inviting you to look closely. I guess I must be proud. I really do feel as if I have just stretched and prepped a canvas. 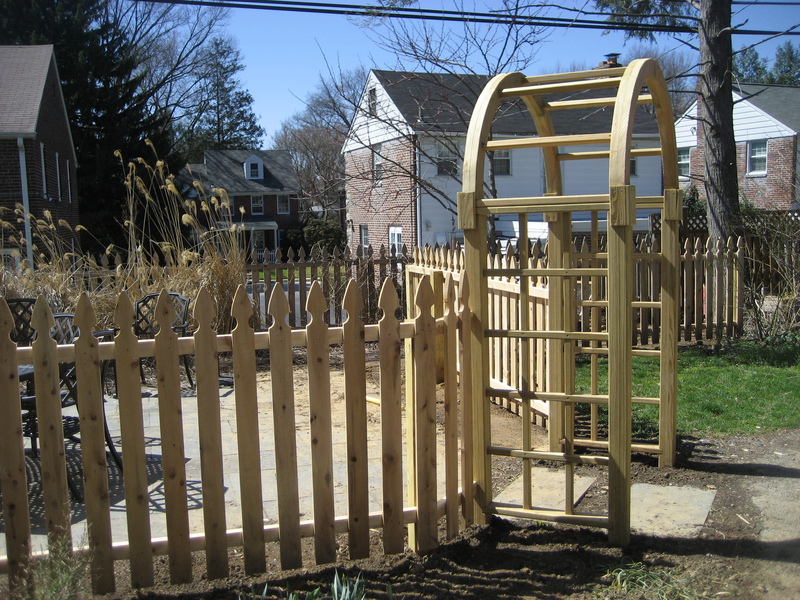 The bed to the left of the arbor will be the 10-year-old’s herb garden. She’s already begging to dig up the spent crocuses that take up about 5 square inches. I’m thinking the arbor will carry a Sombreuil climbing rose per Edith’s suggestion. And maybe a bright purple clematis on the other side. Day lilies around the fence on the right? They’re kind of pretty and green this time of year, with the promise of great color in a few months. Shrub roses, yarrow, and other assorted lovelies in the beds between the fence and the patio. Won’t you come for dinner? A few months ago, my mom asked me if I had any gold jewelry I didn’t want or never wore. With gold prices at an all time high, she suggested I cash in on these nuggets. Well, I did it, and today I spent my proceeds on a long-desired garden arbor. Hurrah! Thanks to all of you who encouraged me after my post on whether to spend this money on the arbor or a flat screen tv. 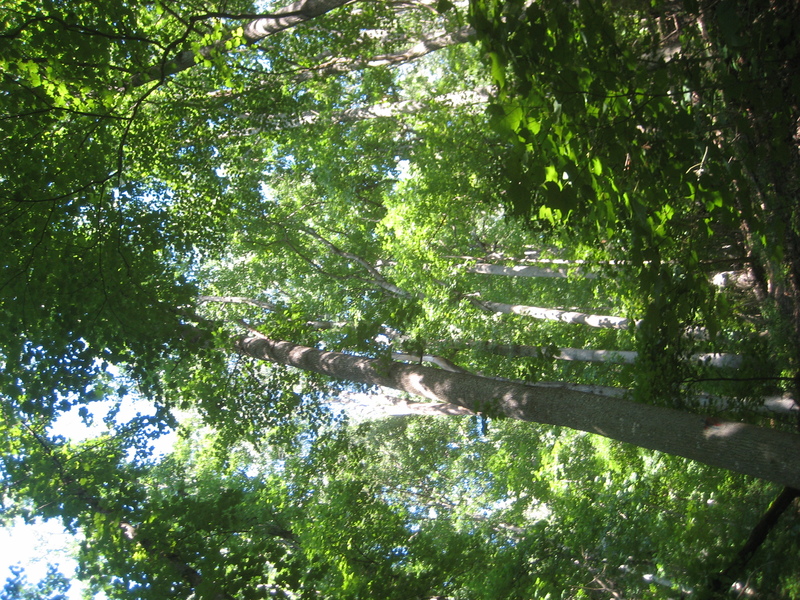 You voted unanimously in favor of the arbor. I’m not sure why I do things the way I do. I could have hired a nice young fencing contractor to order, pick-up and install my new garden arbor and the 60 feet of accompanying fence. I could at least have arranged for the fence manufacturer to deliver all the supplies to my curbside. But no. 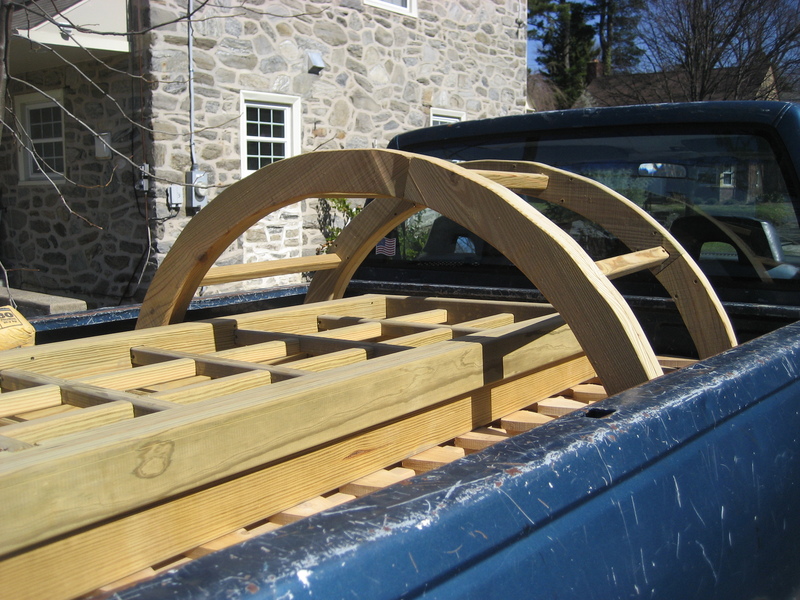 I insist on shopping all the fence suppliers in the Delaware Valley, visiting them to look at and feel the product, arranging to borrow a friend’s pickup truck, collecting the supplies myself, and then trying to install it all. This is how I do things. Why oh why? The main reason is that I’m cheap. The quote for installed fence and arbor was double what I paid. The delivery charge of $95 felt too steep. Think of how many plants you can buy for $95! Second, I like to try new things. Installing a wooden fence doesn’t LOOK that hard – how will I know whether I’m able to do it or not unless I give it a shot? Finally, I do like to brag. I imagine evenings sitting on my patio with friends, admiring the clematis or climbing rose smothering my arbor, being able to say – yeah, I installed that. And planted all the plants you’re admiring. Fortunately for me, my dear friends Kevin and Iris own a pickup truck and are generous to share it with me. (This is not the first hair-brained scheme they’ve supported by lending me transportation). 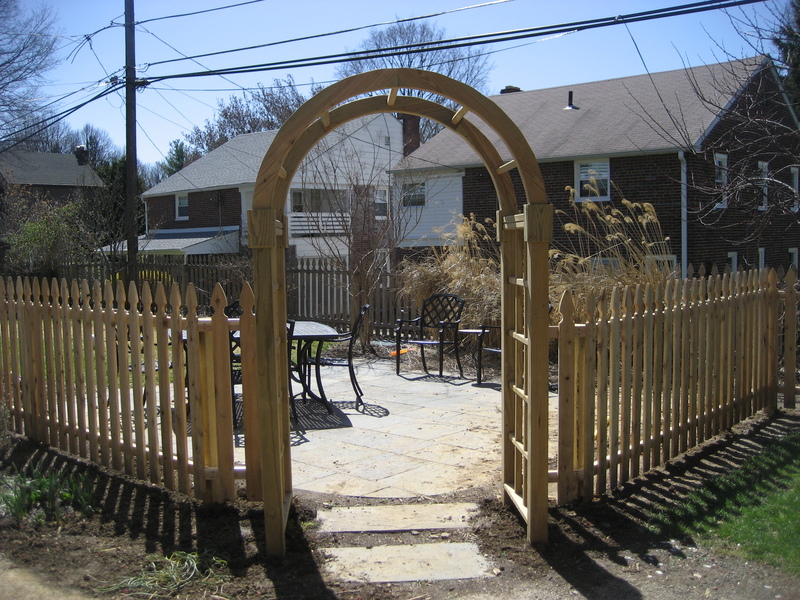 So – the garden arbor has arrived. Within an hour, it was assembled and in place. I was on a roll. I started digging post holes. I had nine to dig – I figured I could knock them all out in a couple of hours. 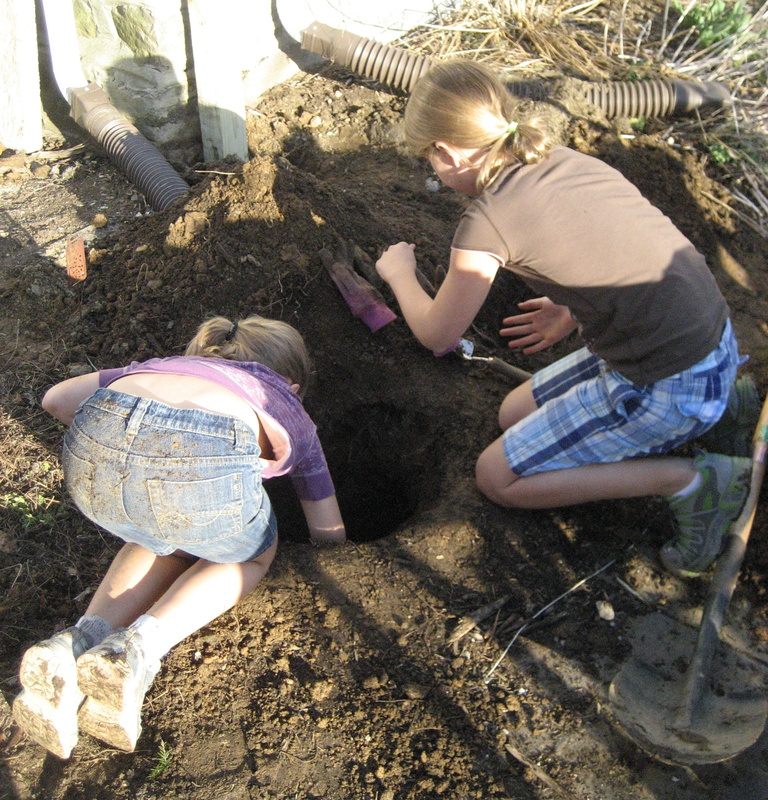 How could I forget my stony soil or the pear tree that used to inhabit the very spot of the second post hole? How could I possibly think I’d be able to dig these holes easily? Again, fortunately for me, my 10-year-old daughter and her friend arrived just as I was about to give in to exhaustion. 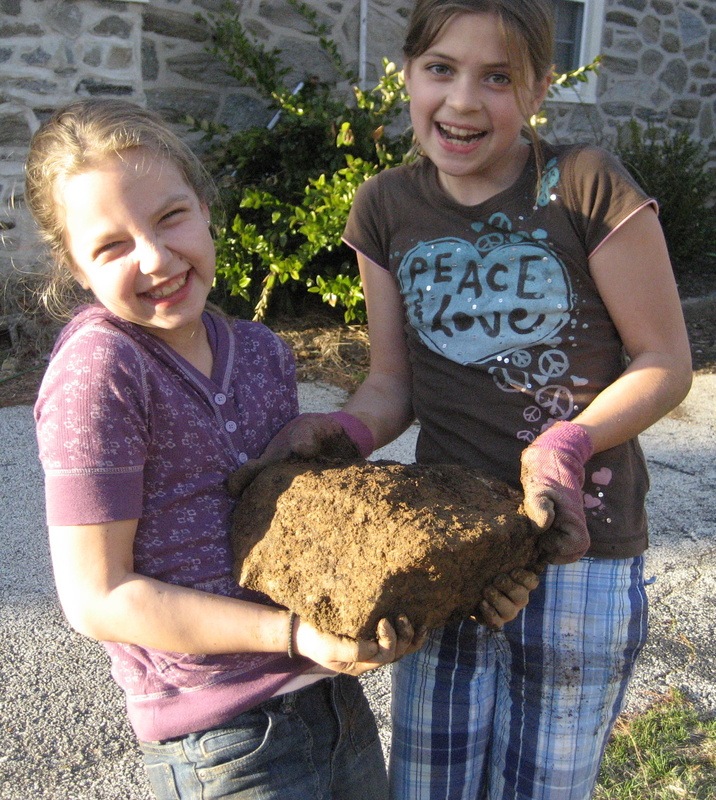 Give two bored fourth grade girls shovels, rocks to excavate, and an excuse to get seriously dirty and you’ve got some good workers. They hacked at roots with pruners. They dug with spades. They dug with trowels. They dug with their bare hands. In an hour, they had hit 24″ on three holes. And had one boulder to brag about. It’s a work in progress. But I look out my kitchen window and see, in real life, the picture that has been in my head for the last three years. I pour over the Jackson Perkins catalog and actually get my climbing rose order ready. I will have jackmanii clematis, not just dream of it. The gold that had been sitting idly in my chest of drawers will now make me very happy. Every day. p.s. I don’t really have a plan about what to plant on the arbor. What do you think? Full sun, facing south west. Zone 6b. My garden is looking a bit sparse for Garden Bloggers Bloom Day in March. I surely was hoping for more. I’m limited to not enough crocuses (never enough!) 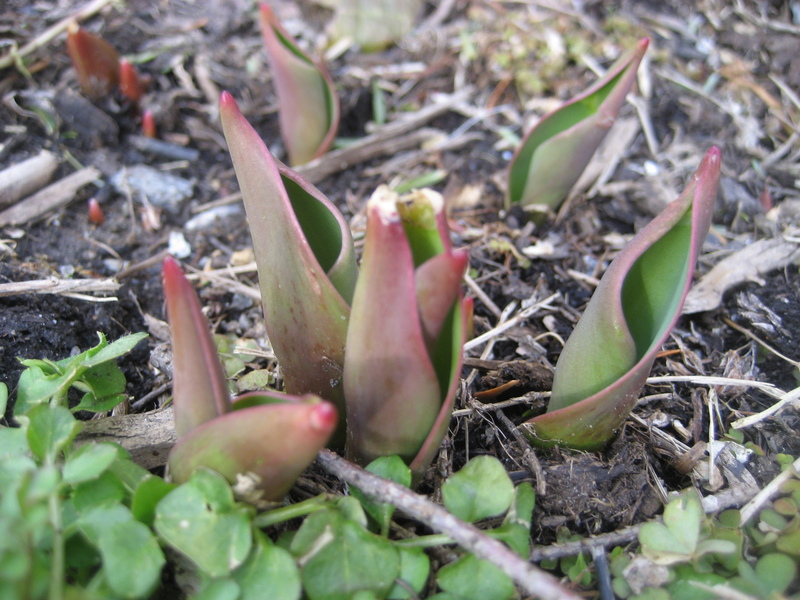 and some hopeful tulip foliage. 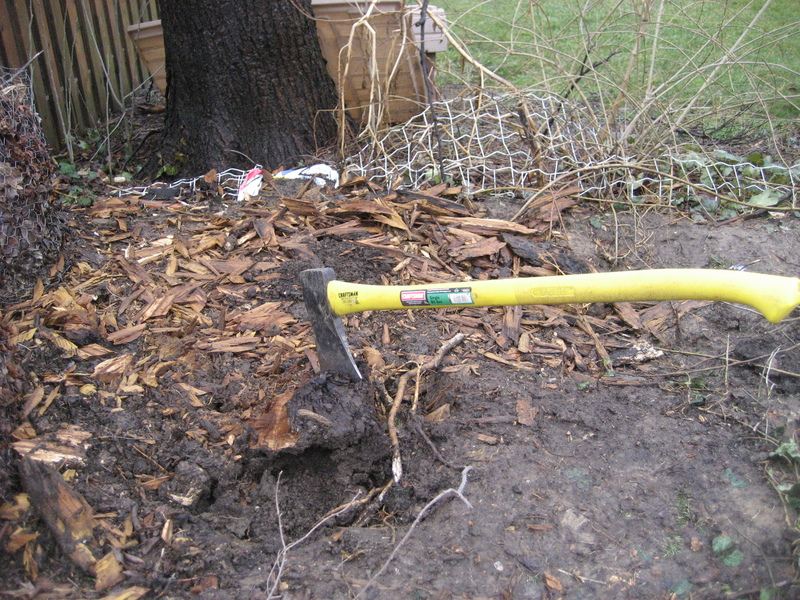 I’ve been consoling myself by hacking away at an old stump with an axe. Excellent exercise and a great way to work out any frustration or tension you might be harboring. So, with not much to report in the garden, I’ll tell you a little story. Last week I visited America’s very first hospital. Pennsylvania Hospital opened its doors in 1751 to much fanfare in Philadelphia. (4th grade field trip chaperone if you must know). Fascinating. And the hospital is still in business which is kind of cool. The tour guide educated about colonial medical philosophies. Laxatives got a rise out of the kids. Folk remedies made them laugh. Leaches had them howling. Conversation about herbal remedies bored the 4th graders but left me wishing I knew which plants healed what, what herbs to take for a headache, how to stew a rosemary stem until it was just right for making your stomach feel better. 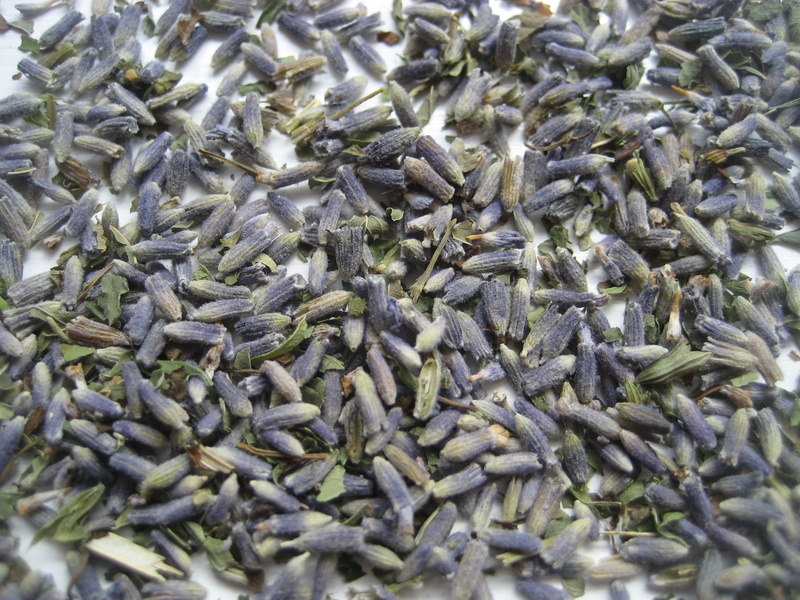 (Does stewed rosemary stem make your stomach feel better? See, I don’t even know!) Colonists had recipe books for herbal remedies – many brought on their long voyage across the sea, many scribbled down from memories of mothers’ brews, many compiled from knowledge gathered from Native Americans. It is an art that has been lost to me, at least. Sure, there’s google, but somehow it’s not the same. Generations of women (and men, but mostly women) knew what to do when their family got sick. All I know is children’s Tylenol. So there I was pining for a simpler time when we were in touch with the land, gardened for more than just our own pleasure, passed knowledge from one generation to the next. Clearly, I was missing the point. While herbal remedies had their place, they didn’t quite cover all the necessary medical treatments of the day. Echinacea and mint tea only went so far when you were facing something like, say, 18th century surgery. The three choices for anesthesia when the hospital opened were rum (lots and lots of rum), opium (which got you good and relaxed, but just until the scalpel hit), or a sharp tap on the skull with a wooden mallet (hard, but not too hard!). Oh, and you had to schedule your drunken, high, or major-head-injury surgery between the hours of 11am and 2pm because that’s when there was enough sunlight in the operating room. On sunny days. But you’ve got to love a field trip that ends with your kid asking, “Can we plant lemon balm in our garden this year?” At the end, the tour guide had each of the children make a sachet of dried herbs like the ones 18th century Philadelphians held to their noses just to make their way through town. Apparently, colonial times stank. Bad. 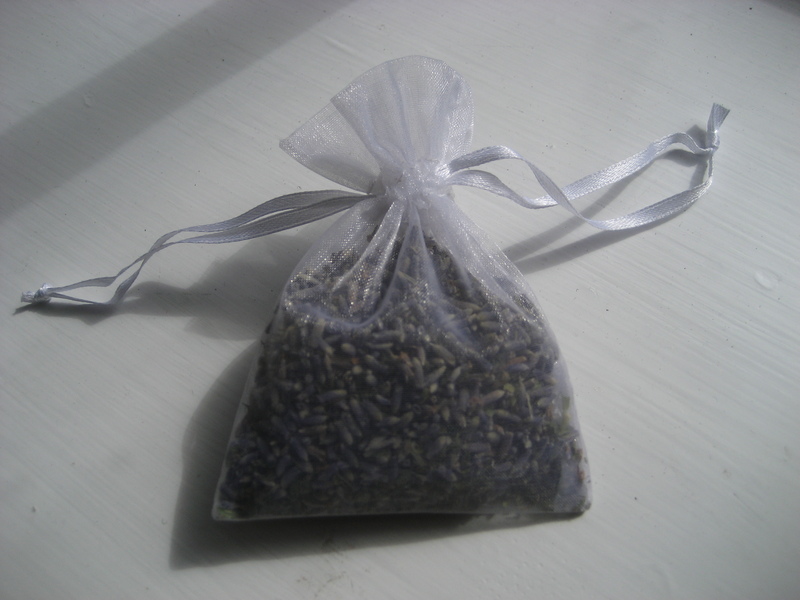 Buckets of lavender, lemon balm, rose petals, cloves, cinnamon, jasmine, and allspice turned into 23 little bags of yummy. We rode home thankful for children’s Tylenol. And anesthesia. And surgeons who wash their hands BEFORE surgery. And delicious sachets that ignited the imagination and took the edge off of that school bus smell. p.s. Thanks to Carol at May Dream’s Garden for hosting Garden Blogger Bloom Day! Chefs not allowed to use salt?!?!? I’m going to take a quick break from spring blooms and tales from my life out of doors to focus on a little indoor politics. And to rant. Brooklyn Assemblyman Felix Ortiz has proposed a bill banning restaurants in the state of New York from using salt in any food preparation. Bill A. 10129 states, “No owner or operator of a restaurant in this state shall use salt in any form in the preparation of any food for consumption by customers of such restaurant, including food prepared to be consumed on the premises of such restaurant or off of such premises.” Fine: $1000 per infraction. I’m sorry, but, EXCUSE ME?!?!?!? Has this man no concept of how to prepare a good meal? Salt is an integral part of making food great. Not too much, mind you, but in just the right amounts it actually makes food taste better. 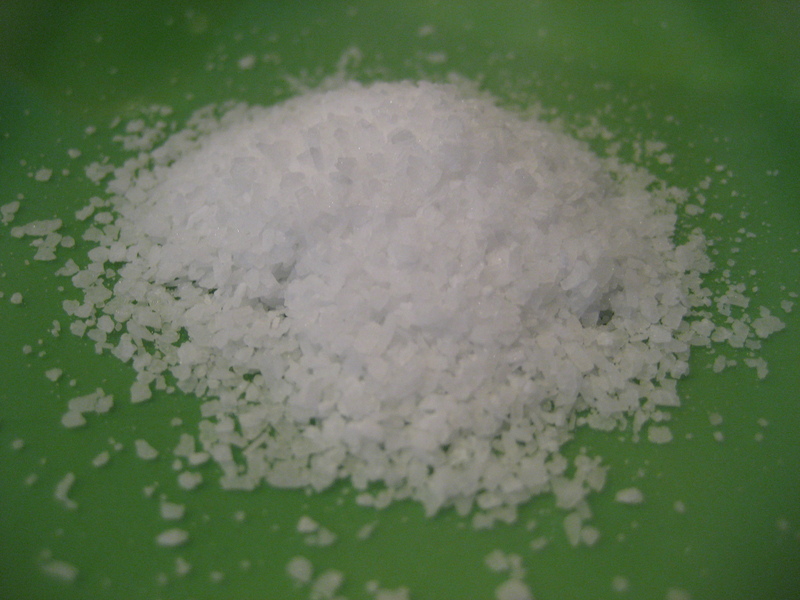 Researcher Paul Bresslin wondered why and concluded (in his 1997 article in the journal Nature) that salt masks bitter tastes in foods, but allows sweeter tastes to come through. A tomato fresh out of the garden is great. But a tomato fresh out of the garden with just a dash of salt is something spectacular. I know too much salt is bad for you. I know too much salt exacerbates high blood pressure. I know that a burrito from Chipotle provides more than 80% of my daily sodium intake. But to take away one of the key ingredients from NY chefs who should actually know how to use salt correctly doesn’t seem to me to be addressing the underlying health risks of salt. Please. I’ve had the great privilege of tasting food prepared by a handful of great chefs who happen to cook in New York City: Tom Colicchio, Bobby Flay, Morimoto, Jonathan Benno. (They’ll be back in Philadelphia for the Great Chefs Event in June). I assure you, these guys know what they’re doing. They can put whatever spice they see fit on my food. There is no doubt that salt would be one of them. Drinking too much caffeine is bad for you. Eating a whole bag of no-salt, low-fat cookies is bad for you. Lying on your couch and watching tv all day is bad for you. Not exercising is bad for you. I admit I have at one time or another been guilty of all of the above. But I don’t see anyone legislating against those unwise choices. I’m sure Mr. Ortiz’ intent (in addition to the buzz that this controversial suggestion is clearly earning for him) was for the health of the people of New York. How about this then? How about an educational campaign to remind people about the benefits of eating fruits and vegetables? Of preparing food from fresh ingredients instead of prepackaged (and salt-laden) options? Of getting off your duff and going for a walk or working in your garden? 1 ripe avocado (diced or mashed), 1-2 garlic cloves (finely minced), 1/4 to 1/2 t. sea salt, 1 small tomato (seeds removed if you want, diced), lemon or lime juice to taste. Makes one small bowl – I usually double or triple this. Tip learned from my New Mexican native mother: return the avocado pit to the guacamole after it’s prepared. It keeps the guac from turning brown. Really works, too. Peel beets (3 or 4) with a carrot peeler. Dice them into 1″ chunks. Drizzle with olive oil, sprinkle with 3/4 t. salt and 1/3 t. pepper, add a teaspoon of your favorite fresh herbs, chopped (rosemary, thyme, oregano). Roast at 400 for 35-40 minutes. Add a touch of yummy vinegar (balsamic, white wine, raspberry, whatever) before serving. Okay. Now I really feel better. I think I’ll go make some guacamole. I spent the afternoon with my two little guys at Morris Arboretum. I basked in the sun and took pictures; the 4-year-old and 5-year-old threw rocks in the creek and ran and ran and ran. It was a visit enjoyed by all. The photo ops started at the parking lot, where I had to squeeze in next to a left0ver snow drift because it was so darn crowded. Under a pine tree were loads of these sunny little buttercupish flowers. They were crocus sized and fabulous. And incredibly intoxicating to the first bees I’ve seen in months. 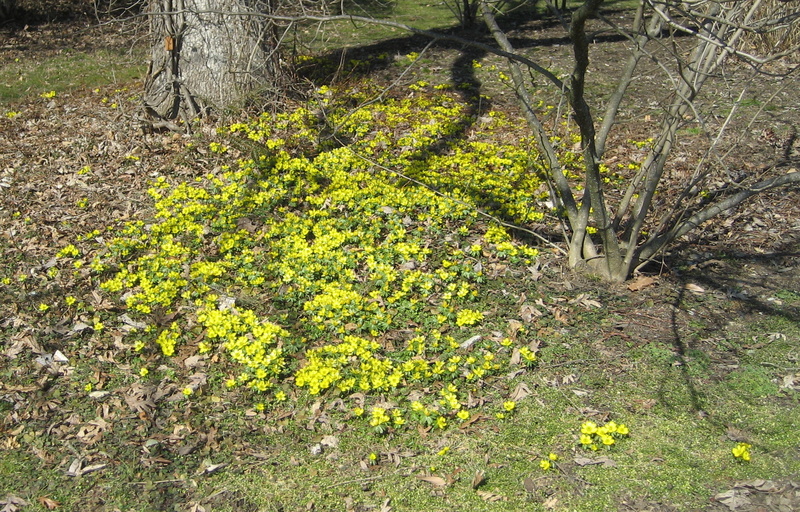 Winter Aconite (eranthis hyemalis) is a native of Asia Minor and Europe ranging from southern France to Bosnia (southern france?!?! – no wonder they exude sunshine.) 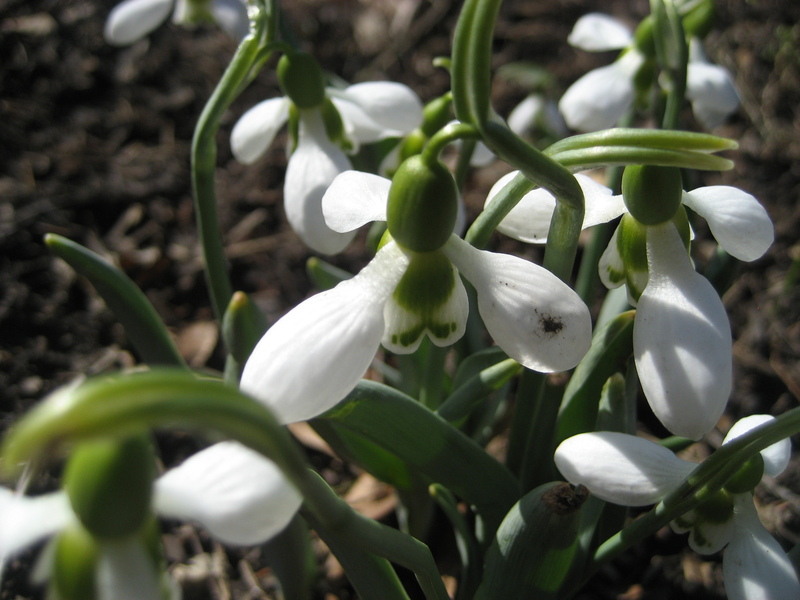 They show up in the very very early spring – around the same time as the snowdrops and before the crocuses. 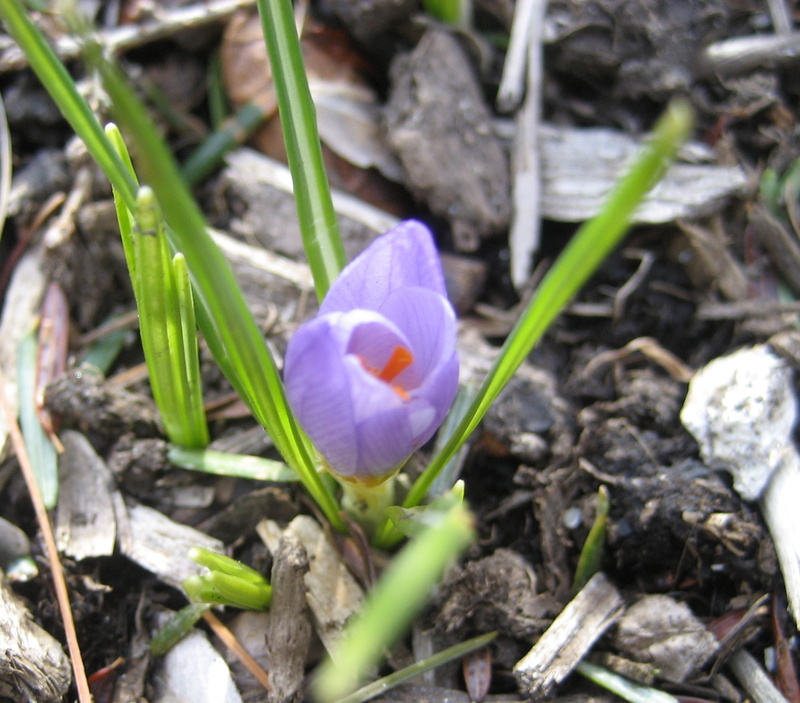 They’re blooming here now with the crocuses because of all the snow we’ve had. They bloom for a couple of weeks, welcome in the spring, and then disappear until next year. They like lots of water. I read quite a few rants about their invasiveness, although because they bloom and go dormant so early, they don’t make too much of a nuisance of themselves. Highly poisonous though – I guess that’s a downside. The University of Wisconsin warns that the tuber can “cause nausea, vomiting, colic attacks and visual disturbances.” Visual disturbances? Are we talking hallucinations? Blurred vision? Near sitedness? 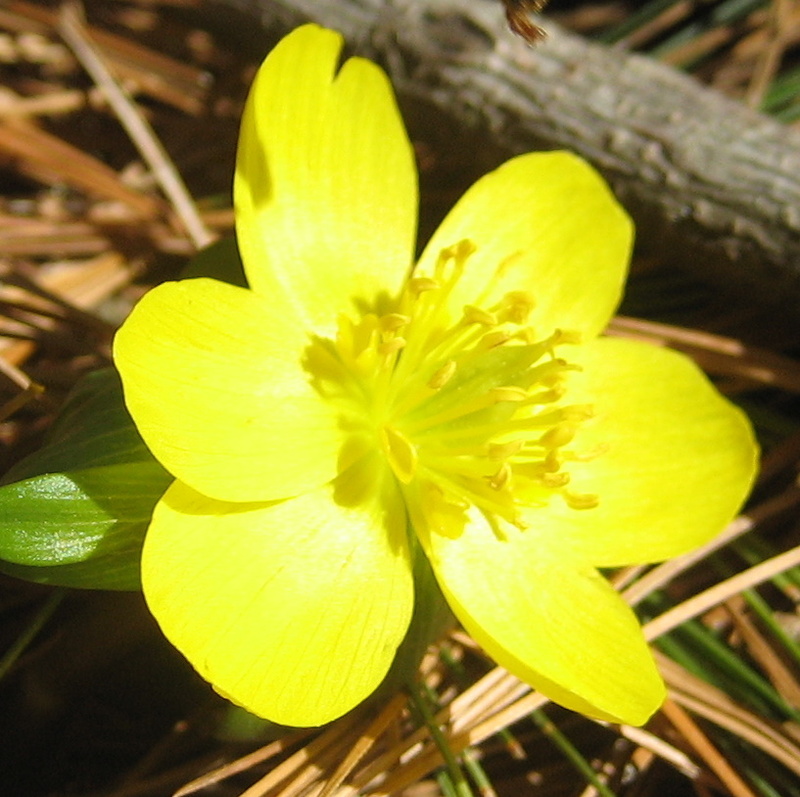 Not to take the warning lightly: don’t eat winter aconite. 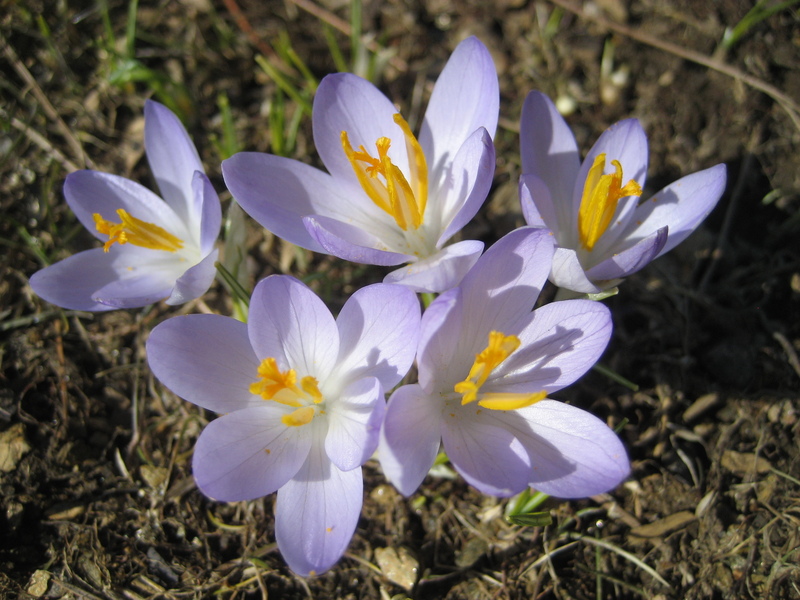 And if you want them in your garden, sow seeds in the fall or divide clumps in the spring. I’ll be doing it. They’re too good to resist. I guess I’ll only have to have one child vomit, contract colic and experience visual disturbances once before they learn that lesson. Besides the Winter Aconite, here’s why today was a perfect day out of doors. A few weeks from now, Morris Arboretum will be so chock full of blooming beauties that I won’t know where to look . It will be stimulating. It will be overwhelming. It will be wonderful. But in a few weeks, will I be stopping the horticulturalist to ask about a buttercup the size of a quarter? Will I look it up and learn about its habits and identify its native growing area? I must admit probably not. Winter (and yes, it is still winter), gives me a wonderful excuse to focus. To focus on the five things that were blooming today, to appreciate them for their special attributes, to plan to add them to my garden. Someone remind me of this in the fall when I’m exhausted by all the stimulation, the overwhelming, the wonderful. This is a tale of the power of life out of doors. 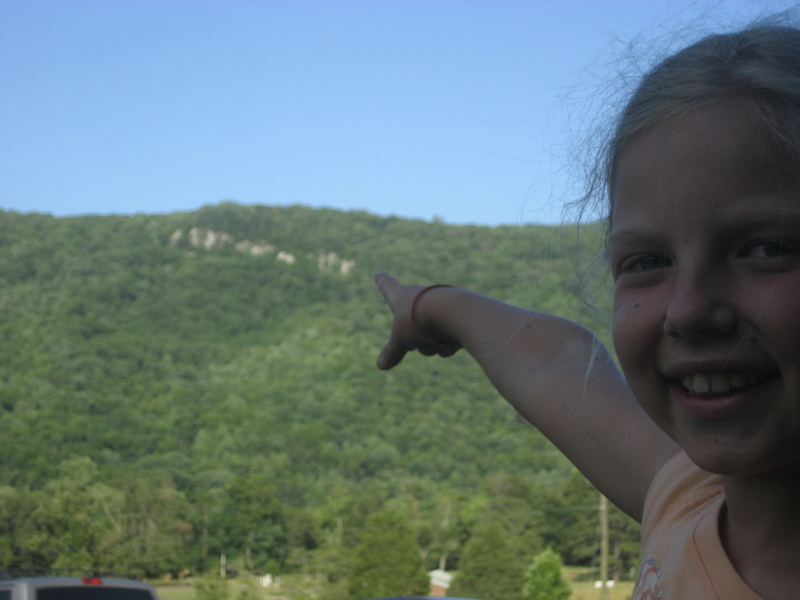 One summer afternoon in 2008, I marched a child up a mountain and saw her character develop right in front of my eyes. Camp Strawderman was the summer home of my youth, and I have the immense privilege to watch my daughter love it as much as I did. 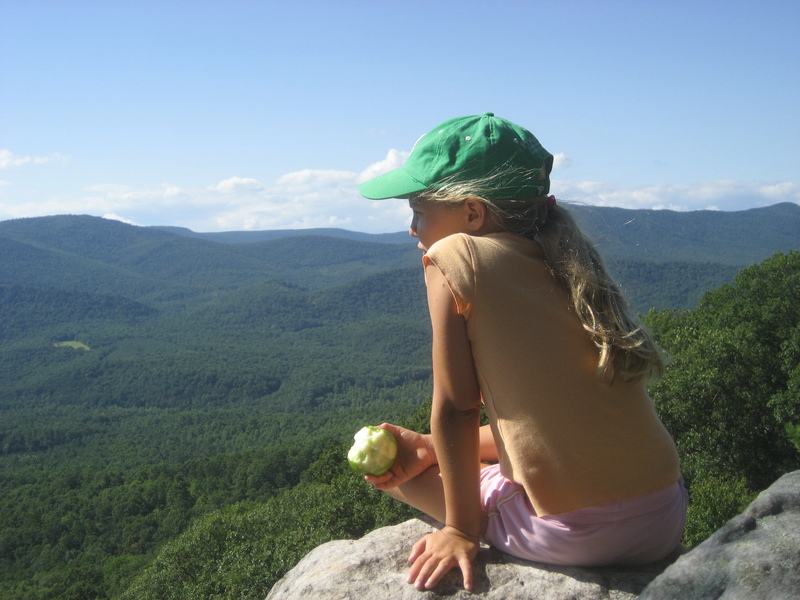 Her first summer, I thought I would initiate her into camp life with a idyllic (in my mind) mother-daughter hike to the famous “rocks.” This outcropping hovers over camp to the east, square in the middle of Three Mile Mountain, part of the Blue Ridge in Virginia. Legend states that the hike to the rocks is “two hours up and two minutes down,” and I do not exaggerate when I say the path goes straight up. Eight year old campers do not hike to the rocks. But it was just the two of us. I figured I could help her through the rough patches. Plus, she would earn some bragging rights. Stony Creek winds its way through the valley, at times curling around sheer rises of the mountain’s side, at others, meandering among meadows. It happened to lie between us and the mountain we aimed to climb. Off go the shoes, across the rocks go the hikers. In goes the eight-year old. Attitude check: all smiles, secure in her ability to laugh at herself. Wet shorts never hurt anyone. After a short walk through sparsely planted woods and up a little ridge, we reach the fire road. This abandoned access road sees neither vehicle traffic nor lawn mowers. As it lies in full sun between the uphill forest to its right and the downhill forest to its left, it has transformed itself into a lovely little prairie. Queen Anne’s Lace, wild daisies, and purple coneflowers attract a host of butterflies and beg to be picked for a bouquet. Nice to look at, annoying to hike through. Above my knees, they reached my eight-year-old’s waist at least. Attitude check: serious deterioration to the sunny disposition. Large amounts of whining. Repeated entreaties to turn around and go home. Open derision to my suggestion that we sing song to distract ourselves. As soon as you pass the stand of cattails (which, I just learned, were prized by Native Americans for their food value and are apparently great in stir-fry), turn right. Beware the first 10 feet of the path up the hill, however. This short stretch of the hike is infamous for housing nasty nests of vicious bees. Here’s how it works: the first few hikers along this section of path stir up the bees, the second wave of hikers experiences the consequences. So, being the selfless mom that I am, I sent my eight-year-old first. Told her to run. She takes a few steps and stops, gripping her right shin. 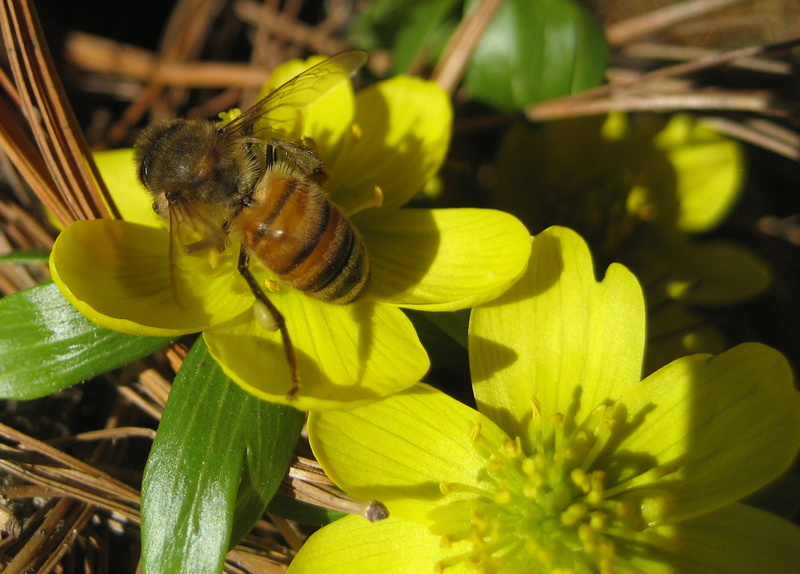 Coming up behind her, imagining a mob of very angry bees, I pick her up, hollering “Keep going! 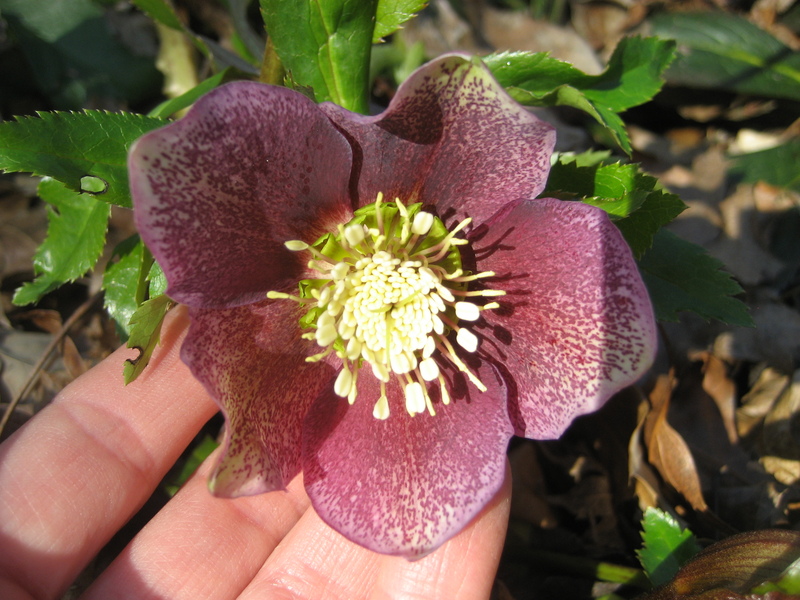 Keep going!” and stopping only when brambles make way for towering trees and sparse understory plants. We assess the damage. ‘Twas not a bee-sting. ‘Twas a nasty branch that jumped up and scraped the stew out of her shin. Not a deep cut, but long and irritating. Guess who brought no band-aids? Attitude check: complete commitment to quitting immediately, retracing our steps and conceding failure. Here’s where it gets steep. Really steep. I’m talking reaching up with your hand to grab roots in front of you to haul yourself up each three foot section. I’m talking trees growing at seriously acute angles to the lie of the land. It’s a hard hike. Remember, we’ve got an eight-year-old on our hands with wet shorts, itchy legs, and a pretty impressive scrape. Attitude check: completely defeated. No belief that she will ever make it to the top and less belief that it will be worth it. Incessant whining. Occasional crying. Increasingly desperate pleas to turn back. We reach the end of the truly steep climb. Here lies a devious little outcropping of rocks that to the uninitiated looks suspiciously like “the” rocks. It even offers a bit of a view. But alas, we are not finished. There is just a bit more hiking to do. This information causes outright rebellion. “I won’t go further.” “No way.” “I am going back RIGHT NOW!” I dutifully ignore every plea and set of for our true goal. I am followed by an angry, weepy, mother-hating eight-year girl. Finally, we set foot on the real deal. Out of the forest and into the sunlight. Mountain breezes blow. Hawks soar BELOW us. 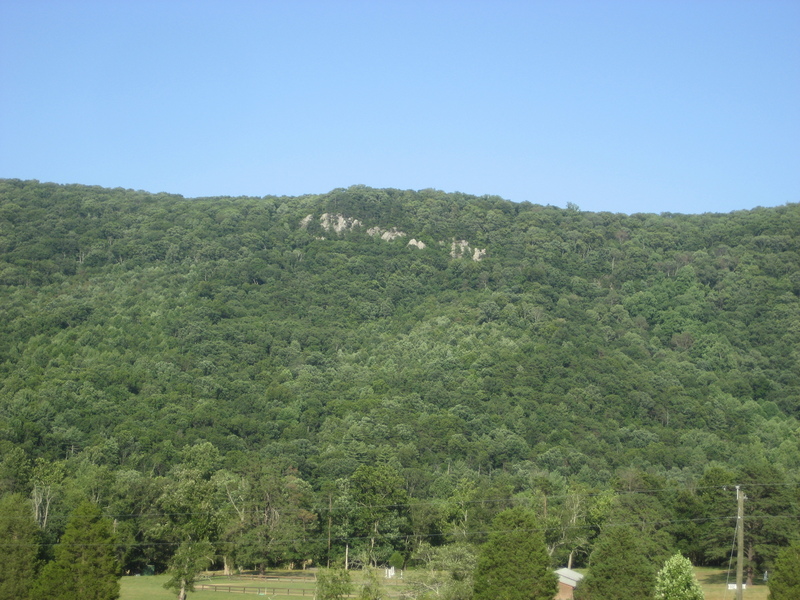 The view is stunning: miles of blue ridge mountains, pockets of cultivated farmland carved out of the woods, puffy white clouds that dot the sky. Camp lies below us as if painted on a map. We trace the road that leads from the dining hall to the rec hall to the pool. We see girls on horseback. We name all the cabins and I tell a memory from each one I stayed in two decades back. We eat our apples and granola bars, call her dad to report our accomplishment, take pictures. I must admit that I lead the way back down hill with some trepidation. As hard as the uphill hike is, the downhill version can be more difficult. Navigating down a steep incline is much scarier than scrambling up it. 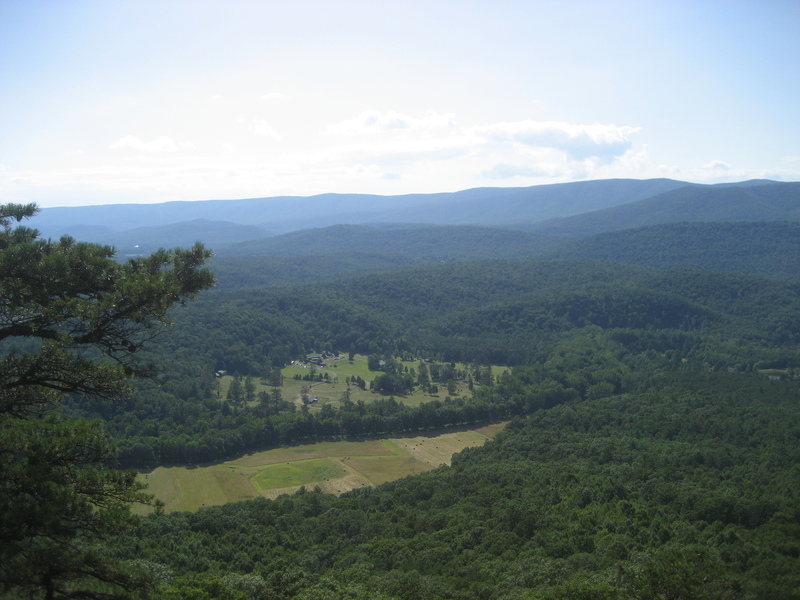 Plus, the fire road prairie will certainly be less than comfortable on the scraped up leg. But, to my astonishment, there is not one complaint. Not one. Not even a little one. The intrepid eight-year old slides down the path on her backside, moving deftly from tree to tree, politely declining any help I might offer. “I think I got it, Mom.” We pass through the bee section unscathed. On the fire road, she is chatty and bubbly and delightful. “I thought this might hurt my scrape, but it’s not so bad.” She tells me stories about friends and we make guesses about what her two weeks at camp will bring. We arrive back at the creek, cross about half way, then sit down and enjoy the silence for a few minutes. With our feet in the cool water, we watch the creek dance around rocks, the sun shimmer on the water, the mountain rise up to our right. It is a perfect moment. Even when the camp nurse scrubs her scrape down to put antibiotic cream on it, the eight-year-old smiles. I took a little kid up the mountain. I brought home a confident, proud, accomplished individual. The power of life out of doors.